Searchers are going through a crash site in San Diego, trying to find a missing 1-year-old after a F/A-18 crash that killed his mother, grandmother and 2-month-old sibling. Just one day after a military jet crashed into a home killing four civilians, the man who lost his family has returned to the scene of the crash, the pilot has been identified, residents returned to the neighborhood and San Diego firefighters released multiple 911 calls made within seconds of the crash. A panicked woman was one of many callers to alert 911 dispatchers. 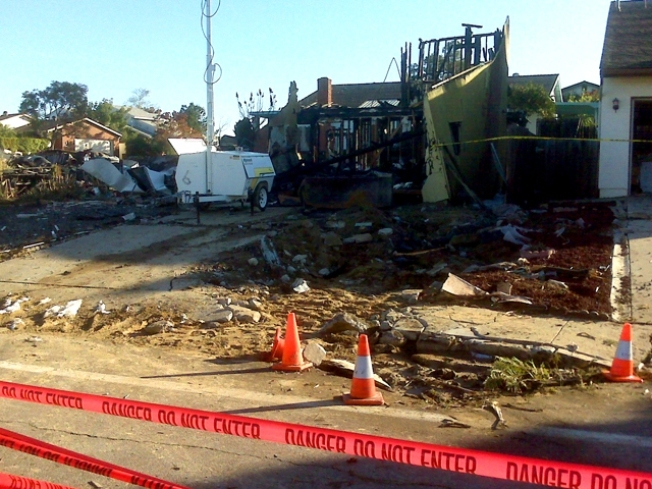 "A plane crashed into a neighborhood," the woman said. Another caller said she witnessed the crash from about a half mile away. "I just saw a military plane go down, and two parachutes deploy," the woman said. Another caller said she couldn't believe what she saw. "I've been hearing explosions, lots of black smoke. You finally got a helicopter overhead. I assume you've been told," said another caller. "We have a plane down," the dispatcher said. "I saw something fall out of the sky. I just wasn't sure that's what I was really seeing," the caller said. Also Tuesday, searchers found the body of 15-month-old Grace Yoon in the entryway of the family's home in the University City neighborhood around 12:30 p.m. Tuesday. A short time later, San Diego police officers informed the father that they had found the child. "This brings closure to the father and the family members," San Diego Fire Rescue spokesman Maurice Luque said Tuesday. Just after 4 p.m., Dong Yun Yoon visited the crash site and made an emotional statement saying he's praying for the pilot involved. One of NBCSanDiego.com's news partners, KOGO, has identified the pilot in the crash as 28-year old Lt. Dan Neubauer. KOGO reports the pilot is with the VM Fat 101 Squadron known as "The Sharp Shooters." On a Facebook page associated with Dan Neubauer the status is "Dan Neubauer is safe. Thank you for all the well wishing." Comments on the page include "Hey man, glad you made it out safe" and "Heard the news. Hope you're ok."
The Facebook page lists Neubauer as a graduate of Esperanza High School in 1999 and UCSanDiego as a Communications grad in 2003. The page lists Neubauer as being a pilot with USMC from "September 2006 to present." The victims in the crash have been identified as Young Mi Yoon, 36, her mother Kim Suk Im, 60, 15-month old Grace Yoon and 2-month old Rachel Yoon. The family had moved to the University City home recently to have more room for the new baby. Kim Suk Im , a resident of South Korea, was in the area helping care for the newborn, according to parishioners. Residents in the area were escorted in Tuesday to get some belongings. One of the neighbors, Choko McConnell, 85, a widow who lives down the street, said she often saw the grandmother pushing a child in a stroller. "I cried all night," McConnell said. "A family perished, a young family." McConnell was eating oatmeal when she heard the explosions. She grabbed a briefcase full of insurance papers and her passport and drove away. "I saw people standing in the streets, bewildered and numb," she said. "When I left, I said I didn't think I'd see my house again." Amy Hegy, a spokeswoman for the American Red Cross, San Diego, said she spoke to the father of the children, Dong Yun Yoon, when he returned to the gutted home Monday night. Hegy said he was "calm" and stayed with friends. She also said he had extended family in San Diego but refused to reveal further details. Two homes were destroyed, three others were damaged and a total of 16 were evacuated Monday's crash. with the exception of four households, all neighborhood residents were going to be allowed to return home Tuesday evening. Military aircraft frequently streak over the neighborhood, two miles from the base, but residents said the imperiled aircraft was flying extremely low. No initial finding of the cause for the crash was given. The pilot attempted to land after the right engine malfunctioned, said a congressional aide who had been briefed but who spoke on condition of anonymity because the information was not yet public. The pilot was on final approach to the runway when the aricraft experienced a loss of thrust in the left engine, so the pilot ejected, the aide said Tuesday. The pilot, who ended up hanging by his parachute from a tree in a canyon beneath the neighborhood, was in stable condition at a Navy hospital, said 1st Lt. Katheryn Putnam, a Miramar spokeswoman. He had been returning from training on the carrier USS Abraham Lincoln off the coast, she said. Investigators will review information from a flight data recorder. There was no indication the pilot was using alcohol or drugs, Putnam said.